Heat grill. In small bowl, combine all ingredients except salmon and dill sprigs; mix until well blended. 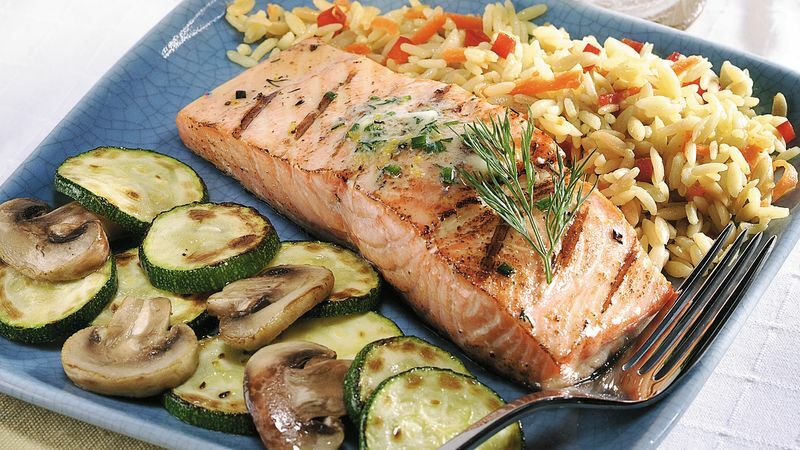 When ready to grill, spread 1/2 teaspoon butter mixture over each salmon fillet. Place, skin side up, on gas grill over medium heat or on charcoal grill 4 to 6 inches from medium coals. Cook 3 minutes. Turn skin side down; spread 1/2 teaspoon butter mixture over top of salmon. Cook 8 to 10 minutes or until fish flakes easily with fork. To serve, spread remaining butter mixture over salmon fillets. Garnish with dill sprigs.